OK, I get it; restaurant guests don’t really need to know what makes a line cook tick, nor should they care. After all, cooks are in the service business and our primary job, just like that of the service staff, bartenders, and managers is to do just that – serve. This is what we chose (for the most part) to do, so …deal with it. As a cook and a chef I understood this and as a culinary teacher for much of my career, this is what I taught, and by the way, believe. However, there is a story worth telling about those who work next to the range, interact with guests, mix drinks and work through the craziness of pretty much every day or nights service, and do so with a nod and a smile. Guests don’t need to know this, but the story is still worth telling. It is a story that plays out in every restaurant, no matter the concept or intensity of menu, and regardless of the size of the bill at the end of the meal. So, I am telling the story from behind the line. It’s six in the morning on a typical day in restaurant life. The prep cook arrives at the neighborhood bistro where he has worked for the past 18 months. He is 28 years old and has been working in restaurants since his first job as a dishwasher at the age of 16. Unlike a few of his co-workers, he never could afford to attend culinary school, but through the school of hard knocks he has been able to make a very modest living in restaurants. He has worked as dishwasher, breakfast cook, fry cook, and prep cook at five different operations. This bistro, thus far, is his favorite, and shows promise in terms of his ability to learn and grow. He walks through the back kitchen door, changes into cooks whites, sharpens his knives, brews a pot of coffee, unlocks the coolers and pulls down the clipboard with his prep list for the day. Unlike other restaurants where he has worked, this place seems to do things right. Everything is made from scratch, they have a real chef in charge, fresh product arrives at the back door each day, recipes are used religiously, and the evening line cooks put each dish together with meticulous care. He is learning something new every day and beginning to consider himself a real cook for the first time. The chef won’t arrive until nine, so it will be important for him to work through the majority of the prep list before then. The Bistro serves only dinner except on Sunday when brunch becomes a big event. His prep list needs to be well under way by nine and complete before 1:00 p.m. when the line cooks arrive. 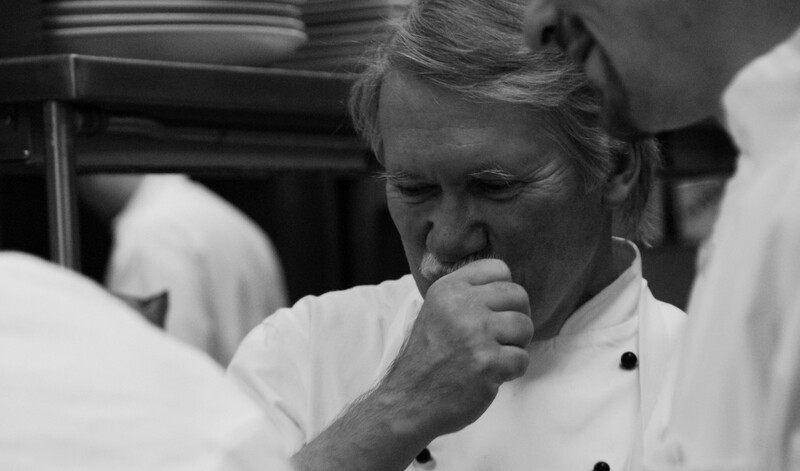 He always finds it interesting that what happens in a quality kitchen is a real mystery to most restaurant guests. That one-ounce portion of demi glace that enhances the filet on the bistro menu takes two days to make. In fact, his first task for the day is to start a veal stock that will provide the foundation for that eventual sauce. He roasts veal bones in the oven until they are caramelized and the marrow in the bones is beginning to liquefy. He adds a mirepoix (mixture of onions, celery and carrots) until they pick up the flavor from the bone fat and marrow and take on that light brown color that brings out the sweetness in the vegetables. After tossing in a small amount of tomato product, the bones and mirepoix are transferred to a large stockpot where a precise amount of water and fresh herbs are added. He brings the mixture to a boil and then reduces the heat to define a simmer with a slight amount of agitation around the edges of the pot. Here the mixture will continue to simmer for a good 12 hours or so until almost 50% of the liquid has evaporated and the stock takes on some real character. The evening line cooks will strain the stock, transfer it to stainless pots, and chill it quickly in an ice bath. The prep cook will find it in the cooler tomorrow with an inch or so of solidified fat sealing the top of the liquid. Underneath, the stock will appear as a gelee, a result of using fresh bones. The fat will be skimmed and discarded, a fresh mirepoix will be added, and a new bouquet of fresh herbs as the stock will continue its journey to demi-glace. Further reductions throughout the day will continue until the stock is now a rich, sticky glace that the line cooks with nurse to its final sauce – topping it with a monte beurre (raw butter) to give it that final delicious sheen. Many hours, refined skill, and many dedicated hands went in to making that single ounce of sauce that made the filet extra special. This dedication and process involving skill and meticulous detail goes into the preparation of nearly every item on the menu that is presented to guests each night in the bistro. Fresh vegetables are washed, trimmed, sometimes carved, separated by size, blanched lightly and shocked in ice water, dried and presented to evening line cooks for last minute finishing as orders arrive from the dining room. Strip loins and tenderloins are trimmed with precision, cut with razor sharp cimetars and portioned for the evening grill master. Fresh fish arrives three times per week. Care is taken to check for quality by looking at the eyes and gills of the fish and then whole fish are gingerly packed in ice with proper drainage to keep them extra fresh until the prep cook fillets and portions items for the nightly menu. When ready, the prep cook will put a razor edge on his filleting knife and cut through round and flat fish with the precision of a surgeon, making sure to avoid cutting into the flesh of the fillet and not leaving excessive meat on the bones. If it is a white fish like halibut or flounder, the bones will be used for a fish fumet or stock and eventually go through a similar, but shorter process of making sauces for seafood menu items. The fillets are portioned in accordance with the standards that the chef has established, and returned to the coldest spot in the walk-in or reach-in refrigerator. By 9 a.m. when the chef arrives, the prep cook has stocks underway, all meat and seafood is portioned, evening vegetables are shocked and dried and ready to go, and work has begun on the evening soup du jour, and items needing to be braised for later service. Just as the chef is walking through the door, the produce truck arrives with daily vegetables. The prep cook stops his work to check every vegetable for quality, count items, rotate product in coolers and storage areas, and sign for receipt. At 9:30, after checking messages, and reviewing reservations for tonight, the chef checks in to see how the prep cook is doing. Everything is on schedule, but the chef notes that he should give him a hand with the final parts of the prep list if everything is to be ready by 1:00. The chef does have a marketing meeting at 11:00 a.m., so a good hour of help will set the prep cook up for success. At 1:00 the line cooks begin to arrive even though their shift doesn’t begin until 2:30. This is really an unwritten rule for line cooks – “Whatever it takes to be ready for service”, always trumps scheduled start times. Line cooks will have their own prep lists (mise en place) that will include, dicing, mincing, chiffonade, softening butter, clarifying butter, pre-marking some steaks on a busy night, picking the scallops clean for the night, reducing sauces, polishing sauté pans, folding towels, deveining shrimp, and setting up their station for efficiency. Every line cook knows that 5:30 will come way too quickly and if their mise is in good shape they can handle anything. If they are behind at 5:30, they will never catch up and service will be hell. Line cooks learn early on to taste-season-taste, keep their stations organized and impeccably clean, and keep their focus on the expeditor and other team members so that service can run like clockwork. Every line cook has been through nights when things go sideways and this is never pretty. It wouldn’t take much for this to happen: shortage of mise en place, a dropped item or forgotten order, a challenging special order from a guest when the dining room is full, a returned menu item that wasn’t what a guest expected, or simply a line cook who wasn’t on his or her game that night. Arriving at 1:00 helps to ensure that these problems are less likely to occur. Guests begin arriving as planned, and, as usual some of the methods used to control the operation are confusing to guests. “Why do I need to wait to be seated? I see that there are empty tables in the dining room.” Well, part of the job of the restaurant host is to pace how many orders are placed at once. Too many at one time will crush the kitchen and back-up service. This is when mistakes are made. “I really would like to change the vegetables and sauce for the dish that I am ordering. Is this OK?” Well, sure, we understand that this is the service business, but the chef and cooks spent a considerable amount of time selecting the right complements for each item on the menu to result in an exceptional balance of flavors and textures. If you change that balance then the dish is foreign to the kitchen staff and they lose control over the intended results. “I know that our reservation for the table of 10 was for 6:15, but it was hard to get everyone together so we arrived at 7:30. That won’t be a problem, will it?” Of course not, even though that is peak time, the dining room is full, the order board in the kitchen is filled from one end to the other, and we gave up your large table at 7:00 thinking that you were a no-show. Yes, we are in the service business, but you can see how these changes, even the ones that seem minor, can interrupt a well-planned system and cause a domino of challenges. Every line cook in a serious restaurant takes pride in his or her work and wants each dish to be just right. Every chef is focused on making sure that the time and effort that went into designing a menu and testing recipes results in exceptional food, time and time again. Every server wants to make his or her customers happy. Aside from the desire to receive a good tip, it is always gratifying when the guest walks away happy. When the night ends, line cooks rarely receive a thank you from a guest – it is not expected. Their worst critic is their own assessment of the work done. If service went smoothly, they were able to make sure that every dish was prepared properly, their station remained organized and they never ran out of mise en place, then it was a great night and they will be proud of themselves and the team. When things do go sideways, line cooks punish themselves and like any other Type A person, they feel the pain. Tomorrow it starts all over again. When they walk through those kitchen doors it is time to forget any shortcomings from the day before and focus on getting everything right tonight. This restaurant position is more than a job; this is a reflection of who these cooks are. 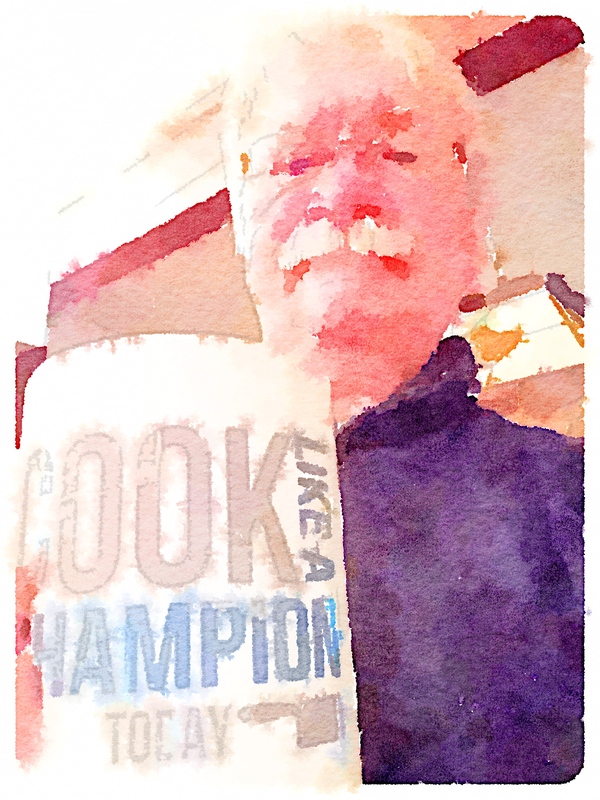 Every serious cook feels the weight of this responsibility and personal expectation. Cooks don’t expect words of gratitude from guests; what they do is what is expected, but maybe, just maybe, the next time you have a great meal offer a word of thanks to the cook and the server. Great post chef! A true to life time line of a prep cooks day in fine dining restaurant.